If you live in Florida and have a trap door to the attic in your house you will find that it is generating over 110 degrees into your living space. Two layers of 2 inch foam will eliminate that problem (without ladders). 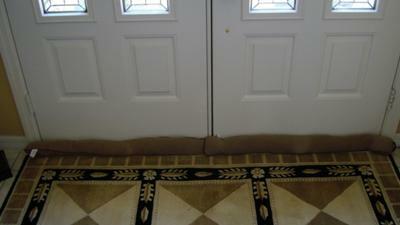 Are you familiar with those long stuffed socks you use at the bottom of your poorly sealed double doors to keep the cold out? What about using them in the summer to keep the heat out? If it works in the winter - why wouldn’t it work in the summer? The biggest air leak you probably have in your home is most likely your bathroom ventilation fan. They normally have a 4 inch diameter exhaust vent that only has a backdraft flap that does not close very well. If you really want to keep the heat out, check out the products offered by the Larson Fan Company (online). Their replacement bathroom ventilation fan has a built in damper that prevents warm humid air from wicking into your house, thus reducing the amount of time your air conditioning will run, saving you a lot of money.